Update:Translated manual can be found here. If you think that a VF-1 is pretty, wait till you get some Fast Packs on it! 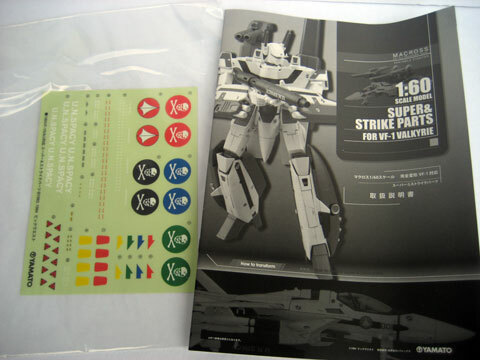 Yamato Toys also recently released a clear version add-on for their VF-1 Super and Strike Packs. 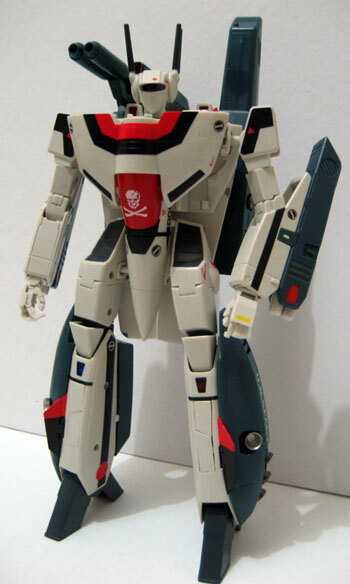 The FAST pack equipped VF-1 first appeared in Episode 24 of the Macross TV series episode titled: Goodbye Girl. 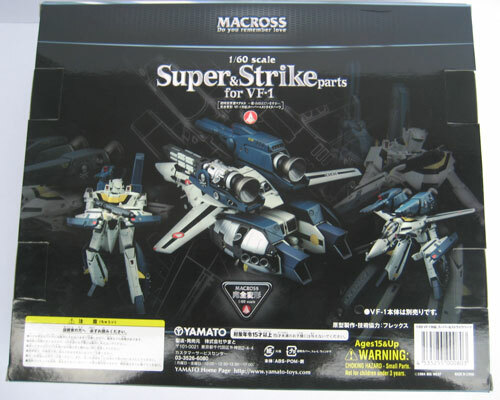 There are two variants of the FAST Pack in the Macross Universe. 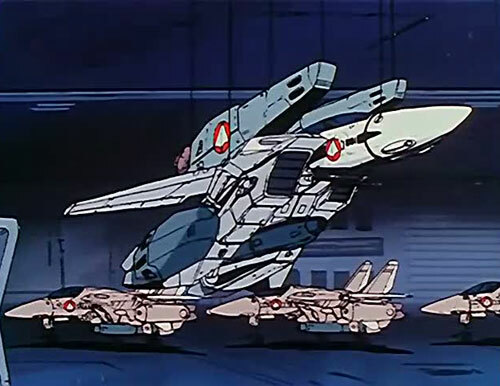 In the Macross TV series, the FAST Pack equipped VF-1 is referred to as a Super Valkyrie. The original variant doesn't have the Cannon mounted on one of its boosters. In the Macross Do You Remember Love, the Cannon equipped VF-1 FAST pack is known as a Strike Valkyrie. FAST packs increases a VF's maneuverability and speed in space owing to the generous amount of Vernier thrusters and additional boosters it provides. It also boosts the VF's range with the increased amount of propellant that can be stored in the packs. Lastly there is the added firepower with the increased amount of missile stores. 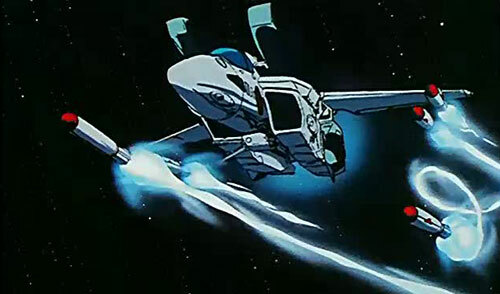 In the Macross Universe, The FAST pack is usually used only in space. Whenever a FAST pack outfitted VF tries to enter any place with an atmosphere (either natural or artificial) it first has to ditch its FAST pack. An example of this are the VF-1's and VF-25's. This is in contrast with the YF-19 and YF-21 of Macross Plus, who have shown that their FAST packs can be used in normal atmosphere during their epic battle scene without affecting the aerodynamics of their craft. Why the franchise decided to regress in this development of FAST Pack technology is something that we have to ask Macross Creator, Shoji Kawamori. Update: My apologies for this mistake and "sweeping" paragraph, the FAST packs of the VF-25's can actually be used inside as atmospheric environment as seen in the television series, not sure if they can do it though in fighter mode, probably only in Gerwalk. Typically a FAST pack has to be installed in the hanger, but the VF-25's FAST packs in the Macross Frontier series has the unique capability of being parked in the orbit of a planet and re-worn without the need of installation equipment. Other than the above mentioned uses, the FAST pack has also been known to be used as Missile Fodder. Conveniently being ditched at a swarm of enraged missiles in order to prolong ones life. 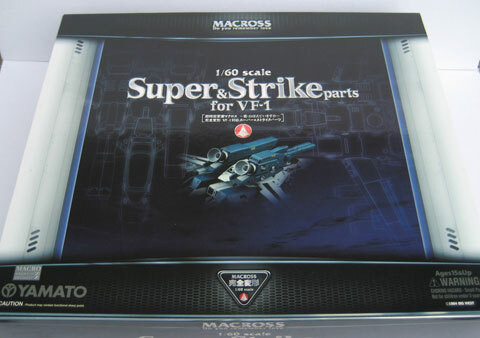 I think I've blabbered on long enough about the Macross FAST pack to the point that I've gone far away from the topic at hand, which is the review of the Yamato 1/60 Super and Strike Parts for the VF-1 that I bought at HLJ during their sale season. 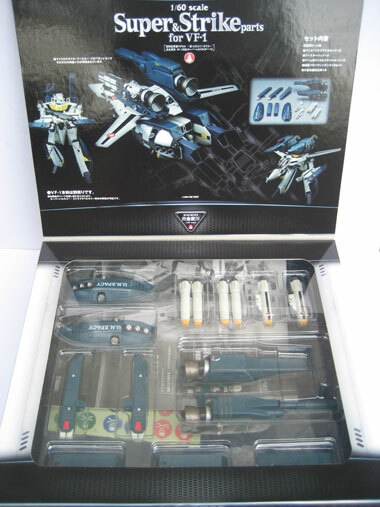 The item includes only the FAST packs, VF-1 is not included with the kit. Box shot of the item. Comes in a glossy colored box. The box has a flip top cover so that you can see the item inside. Good for displays and if you want to keep the sun away from your toy. Inside the box is another half box which encases the 2 piece clear vacuum plastic casing of the toys. The two piece clear casing helps keeps dust particles out because it has a good seal to it. The kit comes with a manual written in Japanese and an extra set of decals. Even without understanding Japanese you can easily understand how its supposed to be assembled given the generous amounts of photos. 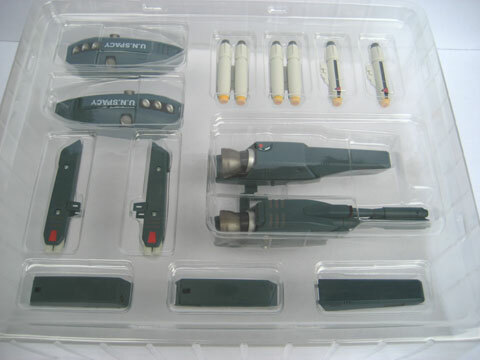 The kits comes with two 2 pack Reaction Missiles that connects to a hole under the wing. The "gimmick" of this part is that you can remove the missile from the hard points so that you can make it look like that the missile had been spent. Reaction Missiles are actually more commonly known as Nuclear Missiles. They were used in the Macross universe to kill large ships. There are also two sets of 1 reaction missile equipped hard-point. You can also remove the missile from its hard point. 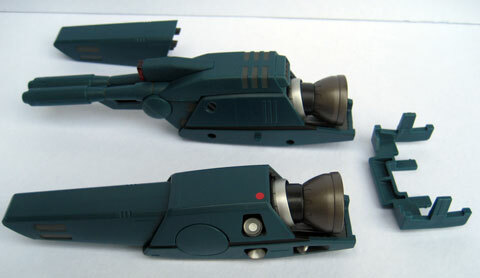 Two sets of arm micro missile launchers. In the schematics provided by the designers, it was shown that this has more then a two shot capability before being spent. It connects to the arm of the VF-1 via the two points that are usually used to attach the rifle to. The arm launchers have a spare point where you can attach the rifle. Shot of the booster shown equipped with a micro missile launcher. Micro Missile Launcher with the top cover removed. Blown up shot of the Micro Missile launcher, booster and cover. Blown up shot of the back booster assembly showing the micro missile launcher equipped booster and a cannon equipped booster for a Strike Valkyrie configuration. Showing the 4 points and holes that allows either the micro missile or cannon to mate with the booster. Highly detailed cannon and the break points where the cannon flexes. Rocket booster engine cover and back of the rocket booster. Rocket Booster Engine with the cover removed. The rocket nozzle is capable of vectored thrust, this allows you to change the direction of the nozzle as shown in the picture. 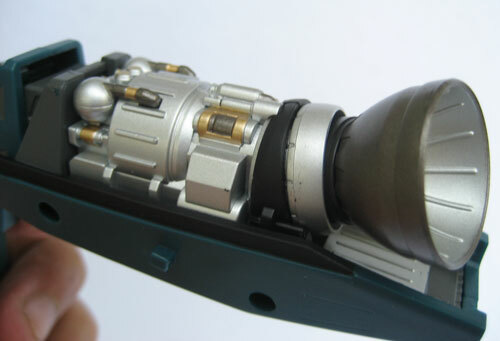 Leg pack with the cover removed showing the vernier thrusters and the spare propellant tanks (silver painted) for increased range. Back leg braces for the leg pack. 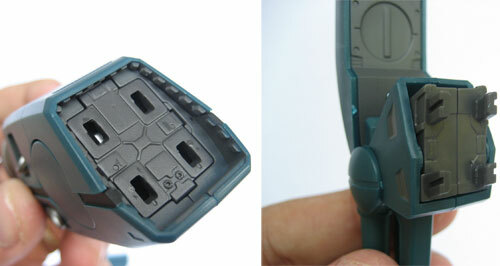 The leg pack doesn't attach to any part of the VF-1 toy, rather its two points connect to the leg brace, while the leg brace connects to two points at the back of the leg of the VF-1. VF-1S of Hikaru Ichijo from DYRL equipped with Strike Parts. I'd have to say that I'm very impressed with the 1/60 Strike and Super Parts made by Yamato. There is a high amount of detail placed in every part of the kit as well as the gimmicks really aim to impress. 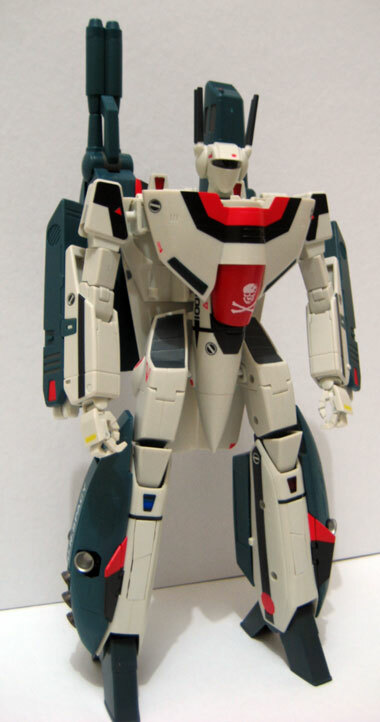 But what impressed me most was the durability of the parts in the way that they fit snugly to the VF-1. There aren't any loose parts in this one!